From a practical standpoint, the two-cent piece was one of the least successful coins in U.S. history: The United States Mint produced it for only ten years, and each year the mintage declined, reflecting steadily falling public interest in the coin. Yet, despite its failure as a medium of exchange, the two-cent piece made a singular and enduring contribution to the nation’s coinage history, for this was the coin that introduced the motto IN GOD WE TRUST. The motto and the coin itself were both direct results of the Civil War. By the end of 1862, with the war in its 21st month, virtually all U.S. government coinage had vanished from circulation; hoarders and speculators—joined by millions of just plain frightened Americans—had set aside every coin they could get their hands on, including not only gold and silver pieces but also base-metal issues. Inventive entrepreneurs came up with a clever replacement: cent-sized bronze tokens, generally bearing an implied or even explicit promise of redemption in goods, services or money. These so-called “Civil War tokens” soon gained broad acceptance as a useful money substitute. The tokens’ success came as a revelation to the Mint; up to then, it had generally been assumed that Americans wouldn’t tolerate money (or money substitutes) with such small intrinsic value. The tokens proved otherwise, and the Mint began preparing a modified one-cent piece modeled after these wartime emergency pieces, a cent that would retain the new and popular Indian Head design but on a slim, bronze planchet instead of the thick, copper-nickel one then in use. At the same time, Mint officials started giving serious thought to a two-cent piece of similar composition, reasoning that this would alleviate the coin shortage even faster. On December 8, 1863, Mint Director James Pollock wrote to Treasury Secretary Salmon P. Chase recommending the issuance of a two-cent piece in French bronze, the same alloy chosen for the slimmer Indian cent. Pollock submitted two proposed designs, both by Chief Engraver James B. Longacre, who also had designed the Indian cent. One bore the head of George Washington; the other depicted a shield and arrows. Pollock and Chase both favored the latter. Up to then, U.S. coinage had carried no reference to a supreme being. But that was about to change, thanks largely to the strong religious fervor born of the Civil War. In 1861, a Baptist minister, the Reverend Mark R. Watkinson of Ridleyville, Pennsylvania, had written a letter to Secretary Chase urging that provision be made for “the recognition of the Almighty God in some form on our coins.” Said Watkinson: “This would relieve us from the ignominy of heathenism. This would place us openly under the Divine protection we have personally claimed.” Clearly, Chase had taken this appeal to heart, for he specified the inclusion of some such inscription on the two-cent piece. Watkinson didn’t come up with the words IN GOD WE TRUST. 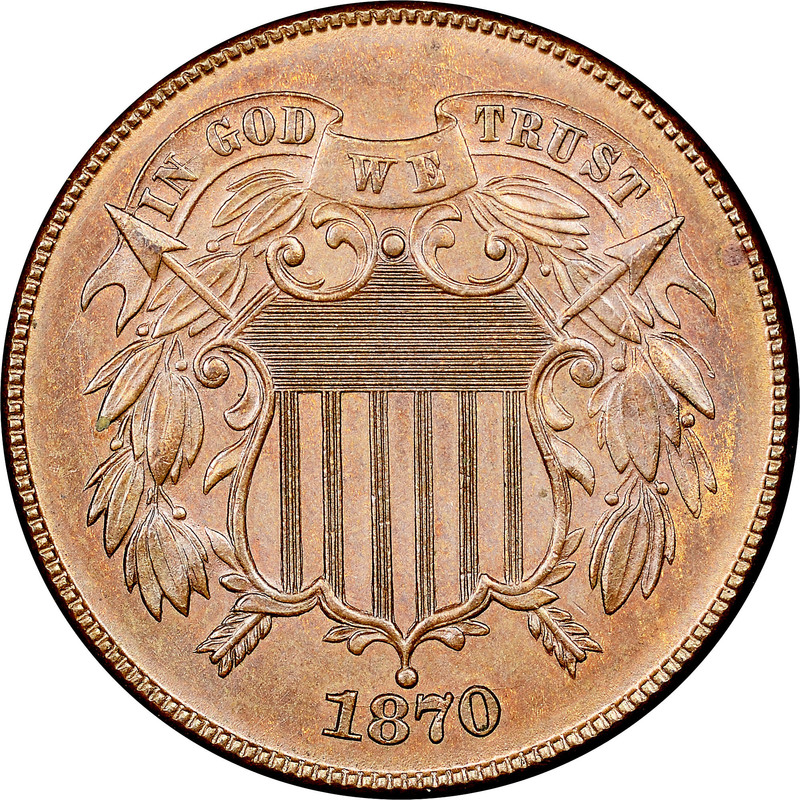 On the first trial striking of the two-cent piece, the motto that appeared was GOD OUR TRUST. Numismatic scholar Walter Breen theorized that the final form was influenced by the motto of Chase’s alma mater, Brown University: IN DEO SPERAMUS, a Latin phrase meaning “In God we hope.” However it happened, IN GOD WE TRUST was the version picked in the end. 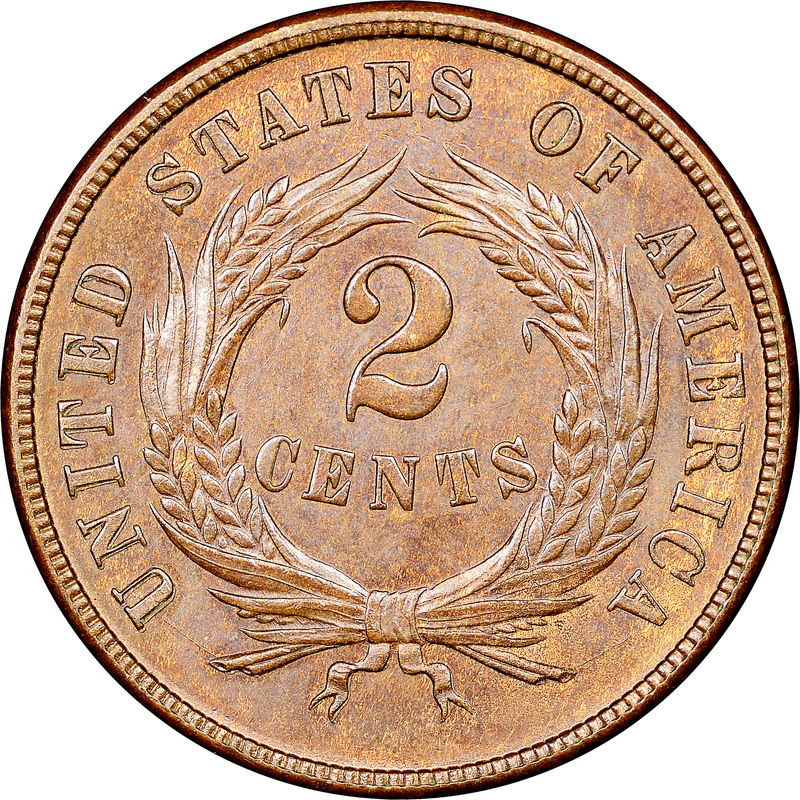 Congress didn’t stipulate the motto in the legislation authorizing the two-cent piece, which won passage on April 22, 1864. That law simply gave Treasury officials discretionary authority concerning inscriptions on the nation’s minor coins. On March 3, 1865, this authority was extended to gold and silver coins and, for the first time, IN GOD WE TRUST was specifically mentioned. Use of the motto wasn’t mandated, however, until 1908; and even then, the order applied only to gold and silver coins. Not until 1955 did Congress enact legislation requiring the inscription on all U.S. coins. On the two-cent piece, IN GOD WE TRUST is displayed on a ribbon above the shield on the obverse. The date appears directly below the shield. The reverse bears a simple wreath surrounding the statement of value—2 CENTS—and encircled, in turn, by UNITED STATES OF AMERICA. Starved for coinage of any kind, Americans readily embraced the two-cent piece when it made its first appearance in 1864. That year also witnessed the highwater mark for the coin’s production, with nearly 20 million business strike examples being made. Output was relatively high in 1865, as well, topping 13.6 million. Acceptance and mintage levels both fell off dramatically after the war, however, as other coins began to reappear in circulation. Fewer than 3.2 million pieces were struck in 1866 and, by 1870, production plunged below the one million mark. Business strikes hit rock bottom in 1872, when the Mint issued only 65,000 pieces for circulation. In 1873, the coin’s final year, there were only proofs. In all, the Mint produced just over 45.6 million business strikes and slightly more than 7,000 proofs. The latter were made in each of the series’ 10 years. Because of its small size and absence of great rarities, this is a set that even collectors of modest means have a realistic chance of completing by date-and-mint (especially considering that only one mint—Philadelphia—produced this coin). In practice, though, many settle for collecting the series by type alone. Although it is unusually short and doesn’t include a single branch mint issue, the two-cent series does contain some interesting varieties. The best known are the Small Motto and Large Motto issues of 1864. On some of that year’s two-cent pieces, IN GOD WE TRUST has noticeably smaller and fatter lettering. These Small Motto pieces are considerably scarcer than their Large Motto counterparts and command much higher premiums in every grade level. There also is a scarce and valuable 1867 doubled-die error, and the proof-only 1873 issues come in two varieties, with a Closed 3 and an Open 3 in the date. On this design, wear first shows on the word WE, the arrow points and the tips of the leaves. Two-cent pieces are readily available in grades up to Mint State-65 and Proof-65, but supplies dwindle sharply above that level. Mint state pieces command higher premiums when they are fully red in color.